Multi-platinum selling, multiple Grammy Award winner, ultimate diva, songbird supreme…All these titles belong to only one name — MARIAH CAREY. With her distinct five-octave vocal range and her signature whistle vocal register, she has legions of devout fans who come together each time she announces a tour as if they were moving at her beck and call. And this comes as a word of 'Caution' — Mariah Carey's 22-city tour is coming your way this 2019. 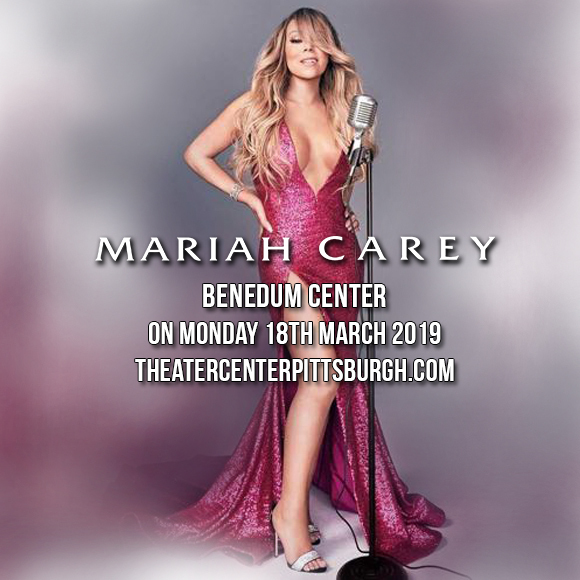 Expect loyal fans flocking to the show as Mariah Carey comes to Benedum Center on Monday 18th March 2019. Tickets will definitely fly out fast, so don't say we didn't warn you. Catch this epic concert while you can! She's the best-selling female artist of all time with more than 200 million albums sold to date. She's the record holder of 18 Billboard Hot 100 #1 singles (17 self-penned), more than any solo artist in history. And they can't take that away from the one and only Mariah Carey. Her five-octave vocal range and the amusing power of her whistle register has put Mariah Carey at the top of pop-music-dom from day one of the release of her very first single "Vision of Love" way back in 1990. That fateful night when she handed her demo tape to music mogul Tommy Mottola, she was already sowing seeds of music success. Her career flourished overnight and over the years with multiple Grammy Awards, numerous American Music Awards, Billboard's "Artist of the Decade" Award, the World Music Award for "World's Best Selling Female Artist of the Millennium," and BMI's "Icon Award" for her outstanding achievements in songwriting, to name a few. She kept the world of music fandom singing along to her long string of hits, namely, "Vision of Love", "Love Takes Time", "Someday", "I Don't Wanna Cry", "Without You", "All I Want for Christmas Is You", "One Sweet Day", "Hero", "I'll Be There", and a whole lot more! And above all, she has become an inspiration to many aspiring new generations of singers. Mariah Carey may have gone through some rough edges and tough times, but she bounces back unscathed and proves to many that she is still qween! Her staying power is further reinforced by her sold-out tours in cities around the world. Marey Carey is a tireless and an unstoppable force onstage. If you're plotting out the concerts you would be watching this year, well, this is a must-see on your list. Be there. Be amazed. Enjoy. Join everyone in saying hail, Mariah!